Set amidst the historic streets and buildings reflecting the town's past glory as one of the richest nineteenth-century mining districts in North America-a history populated with characters such as Meyer Guggenheim and the Titanic's unsinkable Molly Brown-the Leadville Gillian Klucas portrays became a battleground in the 1980s and 1990s. The tale begins one morning in 1983 when a flood of toxic mining waste washes past the Smith Ranch and down the headwaters of the Arkansas River. The event presages a Superfund cleanup campaign that draws national attention, sparks local protest, and triggers the intervention of an antagonistic state representative. 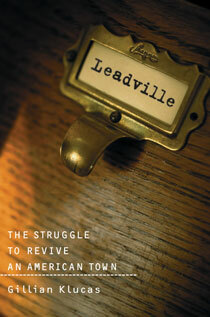 The author's well-grounded perspective, in-depth interviews with participants, and keen insights make Leadville a portrait vivid with characterizations that could fill the pages of a novel. But because this is a real story with real people, It shows the reality behind the Western mystique and explores the challenges to local autonomy and community identity brought by a struggle for economic survival, unyielding government policy, and long-term health consequences induced by extractive-industry practices. The proud Westerners of Leadville didn't realize they would be tangling with a young and vigorous Environmental Protection Agency in a modern-day version of an old Western standoff. In the process, Klucas shows, both sides would be forced to address hard questions about identity and the future with implications that reach far beyond Leadville and the beautiful high valley that nurtures it. "This excellent narrative chronicles the decades-long battle to clean up the town and to redefine it after the collapse of the mining industry....Klucas accomplishes the almost impossible task of making thickets of environmental science, politics and litigation come alive, offering both a pointed critique of a badly drafted Superfund law—which some feel encourages lawsuits more than cleanups—and insights into other approaches. With evenhanded sympathy for all parties as they groped their way forward from intransigence to cooperation, she presents a fascinating inside look at one of the most heated environmental issues of the day." "An astonishing book...an excellent book, both as an environmental case study, and as a dramatic reminder that the battle is not over yet." "Klucas weaves details of history, geology and government policy while populating the story with characters...with the precious and eye of a good novelist."